Synopsis: Katie Takeshima has always looked up to her sister, Lynn, and the way she makes the world seem kira-kira: glittering, shining. Katie relies on Lynn to help her make sense of the world: their move to Georgia, the reason people stare at them, why it’s important for her to go to school. But when Lynn gets sick, Katie is forced to begin to make sense of things on her own and to make the world seem kira-kira again. Why I picked it up: I snagged it at a used book store in Newport, Oregon while I was on vacation. Why I finished it: The two very strong themes that run through this book are the strength of family bonds and the power of positive thinking. Katie and Lynn have a friendship that is unique to sisters, and the ways in which they support one another have a lasting impact on the characters and the reader. Katie might not be as smart as her sister, but Lynn knows that if she works hard and applies herself that Katie can succeed, an idea that becomes more apparent to Katie as she watches her sister decline. Speaking from experience, it can be hard to see the world as kira-kira when everything around you seems so dark and desolate; it can be hard to move on even when it feels like the world is stopping or speeding ahead without you. But what Katie and the reader slowly begin to realize is that Lynn desires for Katie to make her own magic. Katie has the potential to make the world kira-kira for her younger brother and her family in the same way Lynn made the world kira-kira for Katie. Yet, Kadohata’s story runs deeper, mixing grief and helplessness with humor and the special brand of drama that is specific only to families. The first-person narrative gives us a window into one family’s struggle to keep themselves together even though their lives as they know them are changing in ways they could have never imagined. It’s a sweet and heartbreaking story that will leave a lasting impression on the reader. Synopsis: When Flora Belle Buckman observes a squirrel meet an unfortunate fate at the hands of her neighbor’s out of control vacuum, she steps in to save the day. But when this cynic realizes that she has witnessed the birth of a superhero, both girl and squirrel find themselves with a new bond that will change them in unanticipated ways. Seal blubber! Why I picked it up: My grandmother passed recently, and I remember DiCamillo talking in her acceptance speech about her mother being worried about what would happen to her vacuum when she died. Why I finished it: This book had been sitting on my shelf for a while, and in light of what has been going on in my life recently, it’s provided a sort of comfort for me. Flora has been told that she is a cynic by her romance novel-writing mother, and she does view the world with some cynicism, but I don’t think Flora is as cynical as she believes herself to be. She proves to be a hero in her own right when she revives Ulysses after his encounter with Mrs. Tickham’s birthday present. She continues to nurture and encourage him, reminding him when he s unsure what to do: “You are Ulysses”. And when she must leave the house in the middle of the night to find her squirrel who has been kidnapped by her mother, she understands the power of friendship and family. 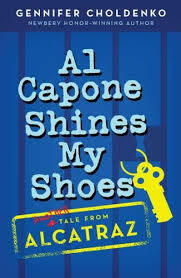 Campbell’s illustrations bring this story to life in a format that blends comics with the traditional novel format. The hybrid format is engaging for the reader, bringing the characters and the story to life, and it ties in with Flora’s favorite comic that plays a key role throughout the plot: The Illuminated Adventures of the Amazing Incadesto! Yes, it is about a superhero and a cynic, but it is also about love and relationships and poetry and food. It’s about the unknown connections we make with each other and the people around us. It’s a beautifully written story that will connect to readers of all ages. Synopsis: When I first moved to Alcatraz, I thought all of the prisoners were on one side of the bars and everyone else was on the other. But lately, I’m not so sure. I mean, Darby Trixle’s been more on my case than usual because of Natalie and I got another note from Capone in my laundry. Turns out, since he helped Natalie get into that Esther P. Marinoff School, now I have to do a favor for him…. Why I picked it up: I wanted to know more about what happens with Moose, Natalie, Piper, and the rest of the residents of Alcatraz. Why I finished it: Choldenko has masterfully created a story that is just as grounded in reality as it is in fiction. The sequel is just as engaging as its predecessor, and it continues to grow and develop the characters in such a way that it’s hard to believe they weren’t really residents on the island. In this tale, Moose is learning hard lessons about friendships when he tries to juggle a friendship with Jimmy and Scout, Piper and Annie, and Theresa and Natalie. He becomes so focused on trying to keep everyone happy that he is gradually destroying his own sanity in the process. Plus, he has to deal with the pressure of trying to return a favor for The Rock’s most notorious resident without completely feeling like he’s betrayed his family. Choldenko’s afterword sheds some light on the events of the book, debunking what was real and what wasn’t: the residents weren’t waiters when J. Edgar Hoover came to visit, but there was in fact an escape attempt called the Battle of Alcatraz in 1946. This book is just as packed with adventure and drama as the first and keeps the reader engaged from beginning to end. It’s a small slice of the real world served up with just the right amount of sugary narrative to satisfy the imagination. 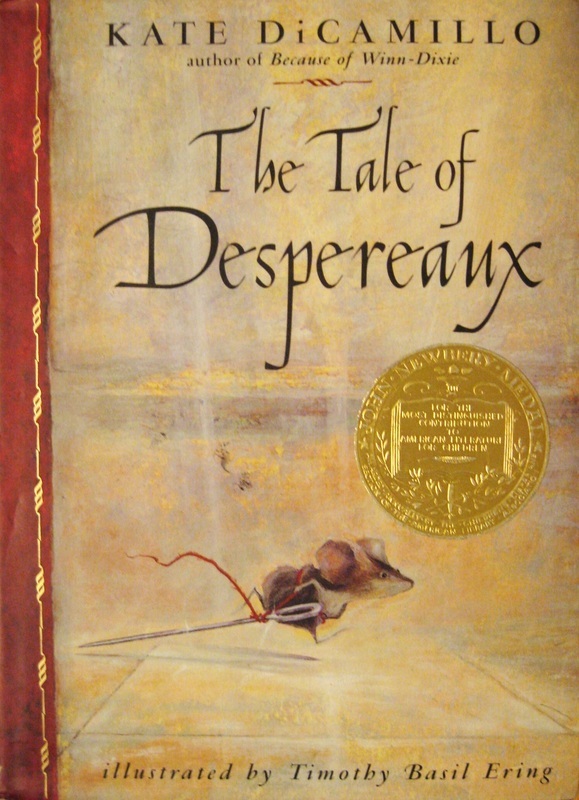 Synopsis: Despereaux Tilling is not an ordinary mouse. Not only is he smaller than a normal mouse and has larger ears than a normal mouse, but he taught himself how to read, he doesn’t like to scurry around the castle, and he is in love with a princess named Pea. Roscuro is no ordinary rat. True, he does live in a dungeon as most rats in the kingdom do, but he has long held a fascination with the light and the world above the dungeons. Miggery Sow is a girl who has a secret wish, a wish to be a princess and live in a castle with servants and ladies in waiting, without people that will hit her on the ear. How do all of these characters fit into each others lives? You’ll just have to read the book to find out. Why I picked it up: I’ve heard conflicting reviews from friends and classmates – some loved it, others not so much – so I thought I would read it for myself. 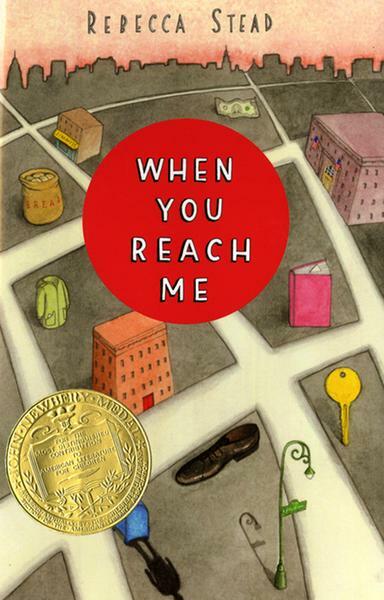 Why I finished it: DiCamillo’s book has a number of things going for it: she is a talented author that has crafted a tale of an unlikely hero, but something about the story lacks substance and while I did finish the book, I didn’t feel particularly attached to the characters or engaged in the plot. Not much is done to develop the characters beyond what makes them stand out. We know that Despereaux has large ears, loves music, behaves in a most un-mousely like manner, has a plethora of brothers and sisters, but even his oddities weren’t enough for me to root for him – but that might also have been because I knew how it ended the whole time. Roscuro is portrayed as slippery and conniving, obsessed with his plot for revenge, but it merely came off as a sort of cookie-cutter villain that is struggling with his own morals. And while Miggery Sow has a role to play in the story, I found her, well, boring. Pea is arguably the least fleshed out: she’s a princess with a love for music and whose mother died when a rat fell in her soup…and that’s about it. I wanted this to be so much more than a book about the sort of casual acquaintances one could make in an office and it could have been. DiCamillo infuses the plot with a lot of heart and humor, creating a delightful soup of forgiveness, love, and redemption, but it was missing the flavor I have come to expect from her storytelling. Synopsis: Abilene Tucker feels abandoned. Her father has sent her to live with an old friend for the summer while he works on a railroad job. But when Abilene arrives in Manifest and finds a mysterious box of mementos, she begins to discover that there is more to the worn-out town than meets the eye. Through the stories of diviner Miss Sadie, and immigrant from Hungary, Abilene learns more about the townspeople all while looking for the mark her father left on Manifest. Why I picked it up: The title caught my eye and I love a good historical fiction novel. 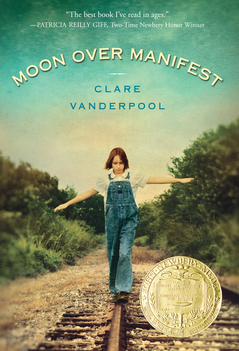 Why I finished it: Vanderpool’s debut is a story filled with mystery and heart that tells the reader about looking into the past to understand the present. Abilene wants to be able to understand her father, but she’s unable to do so from just the stories he has told her. She regards her father as a sort of mysterious person that for reasons unknown to Abilene, seems to want to keep her at arm’s length. A chance meeting provides her with an opportunity to learn more about her father and provides her with a way to not only finish a summer assignment, but become more involved with the townspeople. In many ways, we are like Abilene, searching for answers about why and how we have ended up where we are. We want to know where we came from, we want to know how the past has shaped the future, we want to be able to better understand ourselves and where we fit into the larger picture. Weaving between 1918 and 1936, Vanderpool takes us on a journey and tells us story about survival and the power of love to overcome our hurts. Synopsis: Sixth grade is turning out to be a confusing time for Miranda: her best friend Sal suddenly won’t talk to her after he gets punched, someone stole the hidden key to the apartment she shares with her mother, and she’s been receiving mysterious notes from a person that seems to know about things before they happen. Will she ever talk to Sal again? Will she figure out who is sending the notes? More importantly, should she write the letter requested by the mysterious sender or will she be too late to save her friend’s life? Why I picked it up: It’s another one of those books that has been sitting on my reading list for a while and it’s heavily circulated at my local library. Why I finished it: Stead’s writing is a delightful mix of science fiction, mystery, and adventure that bears a strong resemblance to Miranda’s favorite book, A Wrinkle in Time, which was also one of my favorites when I was in elementary school. She takes us into Miranda’s life and into her head as she navigates the minefield that is her life without Sal. Miranda struggles with the notion of time travel (even though it is repeatedly explained to her by two different people over the course of the novel), but she slowly begins to realize that it is the only explanation for the mysterious notes and how the sender knows about things that have yet to happen and even knows some things that no one should know. She’s also struggling with losing her friend Sal and trying to make friends with the girls in her class, some of whom she thinks are rather petty. Plus, she’s been helping her mom practice for The $20,000 Pyramid, which is a challenge in and of itself. But through all of these experiences, Miranda is learning that sometimes the things we don’t seem to understand are the most plausible explanations, if only we are willing to let go of our pre-conceived notions about the world. Synopsis: Ten-year-old Lucky wishes she could find her Higher Power, like the people in the twelve-step program meetings on which she eavesdrops. But when you live in the small desert town of Hard Pan, CA, Pop. 43, there’s not much of a chance of finding your Higher Power…unless you hit rock-bottom. As Lucky reaches rock-bottom and begins plans to run away from Hard Pan, she starts to understand that rock-bottom might just be another way to start over fresh. Why I picked it up: It popped up in the Amazon Recommendations and I was intrigued by Lucky’s desire to hit rock-bottom. Why I finished it: Lucky is a remarkable character because of her belief that she has to go down to go up. While this might not be true for most everyone, Lucky shows us that there is hope to be found even when your situation seems to be getting more and more dire…well, dire by ten-year-old standards. Haunted by the threatened departure of her Guardian and the fear of losing her dog HMS Beagle, Lucky’s carefully constructed life slowly begins to crumble and not even her friends Miles and Lincoln can convince her to stay in Hard Pan. But if it means that she can find her Higher Power, it will all be worth it…won’t it? 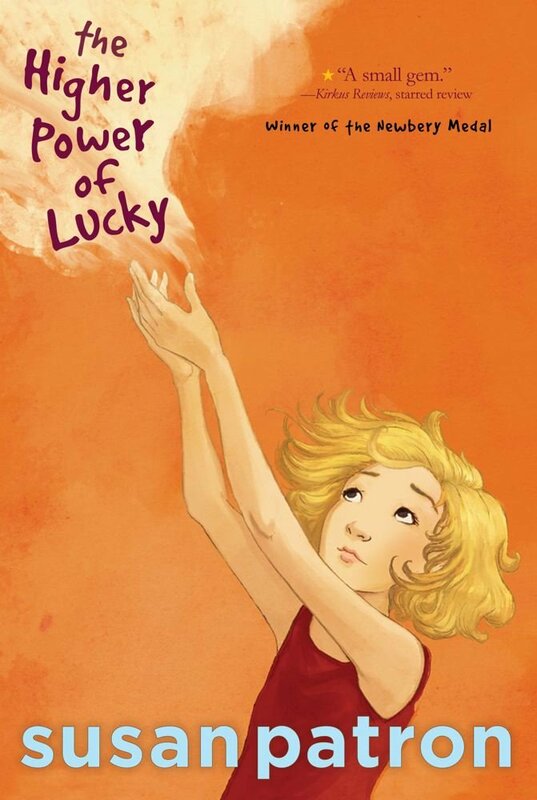 It’s hard not to admire Lucky’s pluck, love, and determination to reach a place in which she feels like she has some control over her destiny and has a feeling of what it is she is meant to do. Phelan’s black-and-white sketches add another layer of realism to the story and aid the reader in visualizing the setting and the characters. There’s something to be said for their simplicity as well; it beautifully compliments Lucky’s struggles to get back on top and back in control of her life and get answers to the questions tucked deep in the crevices of her brain glands. A sweet and touching beginning to a deeply moving trilogy that makes us remember the hardships of growing up.